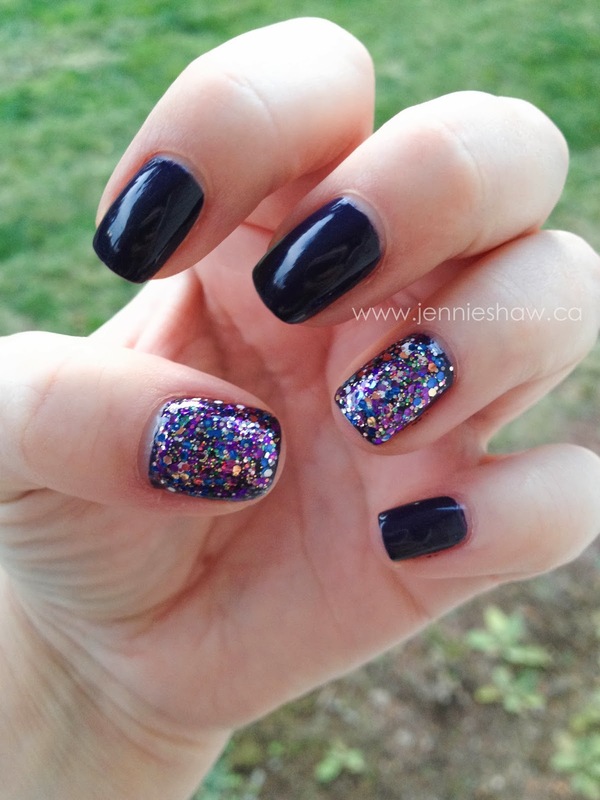 jennie's nails and tales: the nail files: more sparkles. always more sparkles. the nail files: more sparkles. always more sparkles. Ever have one of those manis that just never looks right so you keep heaping on different glitter until it's dangerous to look at your fingers without sunglasses? As you can see, the glitter is a tad out of control but is that really a problem? Hint: the answer is no. Haha! On top of two coats of Wild Wisteria, I started with one coat of Glitter All The Way (too mardi-gras-esque)…followed by a coat of Can't Be Tamed (better, but still mildly mardi-gras-esque)…then a coat of Polka.com (too much purple, kind of dulled Can't Be Tamed)…and finally, a coat of Your Present Required (perfection!). I'm sad because this picture doesn't do the shine justice AT ALL, but when I went into the light, my iPhone had a mini-meltdown because the insane glittery-ness made it impossible to focus. Hahaha! Have an awesome weekend! Especially for you Americans--leftover turkey sandwiches, HORRAY! That's a whole lofts glitter lol! Very pretty! Looooove this combo! Those nails are jam-packed with glitter!! I have glitter on the same fingers this week as you. You know, with the non-glitterfied nails, it's a good balance and not too kapow. Well done!